Sassy Cheryl's Digi Stamps Challenge Blog: Pearls, Satin and a Blog Hop! Hello to all of our sassy friends.. and welcome to our latest challenge and BLOG HOP! It's a special day, and if you read on, you'll get all of the details. Jennfer Cruz. Jennfer.. just email Sassy Cheryl to make arrangements to receive your gift. Happy coloring to you.. and thanks so much for joining us in our challenge last week. A $25 gift certificate to her shop to one lucky person that participates in our blog hop challenge using our "Pearls and Satin" theme along with an image from Sassy Cheryl's, of course.. selected randomly. A chance to win a digi at each one of the DT's blogposts... hmm.. that's a lot too! You won't want to miss one opportunity to win an image from Sassy Cheryl's and you can enter at each DT members blog or online gallery post. We'll pick one winner next Sunday and announce them in our challenge next week. Starting right here, here's the rest of the blog hop order in case you get turned around.. So, get moving, Sassy friends.. we'll see you along the way... and thanks for playing along with us and for being such supportive, sassy friends and for making this a great year! Let's get started and use these wonderful DT cards as inspiration to join in. Cheryl, thank you for continuing to create images for us to have so much fun with. 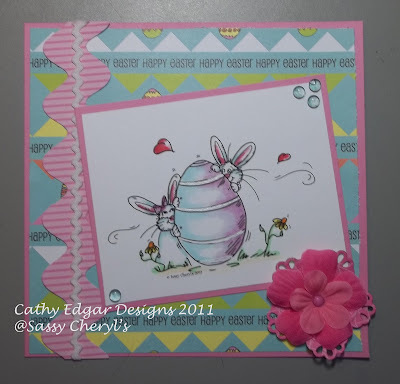 Gorgeous cards from the DT, with of course....adorable images. Hope to hop later! FANTASTIC HOP! The DT has all created such BEAUTIFUL cards!! I'm off to make mine now for the challenge.. I am a new follower and I can't wait to hop! I will also do the first challenge. Thanks for such beautiful images.. I just finished the hop and left all of you AMAZING card artists a little love! I so enjoyed looking at your wonderful creations.. I'm a huge Sassy Cheryl's fan and you really bring these cute and fun images to life! Thanks for all the inspiration!!! Congrats on the anniversary and thanks for creating and sharing your precolored images. Man... a hop, prizes, challenge AND a sale!!! You couldn't make us much happier!! Thanks for all the fun!!! Wonderful projects from the DT! Hopping along to the next stop. Blog hop done and the cards were all incredibly beautiful. Now I need to shop. HAPPY ANNIVERSARY!!! OK... time to hop off now! It's been a year???!!! WOW! Time flies when you're being creative! Thanks for the hop and for sharing all of these delightful projects with us!! Beautiful DT cards (as usual). You have a wonderfully talented team. I had a great time hopping. Thanks for the fun. Finished the hop, each card is stunning! What a talented team! Hope I got the elements right this time! I hopped to every blog on the hop, what great crafters! Just found this blog, and love the images, went and bought some, teehee....love everyone's work! Hi I tried to hop to Judy's, and it took me 10 minutes trying to fill out forms and such, now waiting for approval....JUST to blog hop?????? No other DT, anywhere does this...it is not her business where I live or my birthdate..
WOW, ok i just came across your blog and digi stamps, i totally had to purchase some NOW, they are fantastic. Hoping to join you in your challenge, as i have some great digis to color...tfs! Great blog hop, ladies! Wonderful inspiration. Great challenge again this week as well. I've just recently discovered your stamps & they are adorable. Great cards posted & I showed up in time for a fun hop too. Thanks for all the great comments ladies. We really appreciate them!!! Really cute images and great cards! Great Hop! Great DT Cards! Great Prizes! Here's my first challenge, I had so much fun with your image. Thank you. Extra big yays - I sat with my gel pillow and completed the blog hop! But don't worry Sassy Boss Lady. I'm going to lie back and REST right now this very minute!! hehe. Cathy Edgar suggested that I enter this card in this week's challenge, so here I am! There is a bit of satin ribbon on the little lace posy, and the stick pin I made has little pearls on it, so I guess I'm legal! LOL!